No mess, no fuss - just enjoy! Silicone is an absolute must for kids who like ice-cream and adults who don't like mess. The drip stop prevents the ice cream from spilling down the hand and on to clothes, so that you can enjoy your ice cream without making a mess, where ever you are. The cone material is soft which makes it easy to push up that last bit of ice cream. It can be filled with soft ice cream, scoops of ice cream or a waffle and just serve it again and again. The cone is top quality and made out of food grade, non-toxic silicone. Dishwasher safe. Can withstand temperatures between + 230 to -40 degrees Celsius. Comes as a set of two holders. Vroom! Make mealtimes more fun with this grey rally car placemat by Swedish brand KG Design. It's made from tactile silicone, so it's non-slip, dirt-resistant and easy to clean. Stylish and practical, it's perfect for the smallest dinner guests as you'll save your table from spills, plus bowls will stay put on the non-slip surface. Encourage your little one to drink more with the fun Design Letters Alphabet Melamine Cup. Cute, easy to hold and just for kids, this great cup will have them drinking every last drop of their water, milk or juice in no time at all. Made from melamine, the Design Letters Alphabet Cup is light yet durable. As such, it’s simple for little ones to use but hard for them to break. Designed to make mealtimes fun and help teach children the alphabet, the Design Letters range is stylish, entertaining and educational. When it comes to the cup, you can select any letter from A - Z. Having this choice allows you to tailor your collection and pick whether you want your child’s initials, name or the whole alphabet. 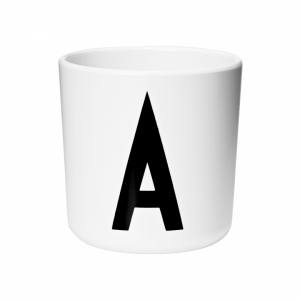 Featuring a minimalistic yet eye-catching design, the Design letters Alphabet Cup boasts iconic typography by Danish designer Arne Jacobsen. Who says mealtime has to be boring or a struggle? 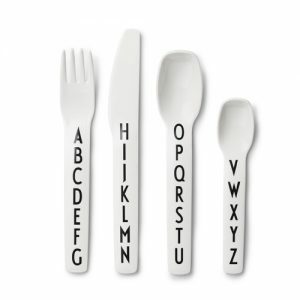 With the Design Letters Alphabet Melamine Cutlery set, eating can become fun and easy. Specifically created for children, this cutlery set is perfect for hungry little ones. Made from melamine, the set is safe for soft mouths and easy for small hands to hold. Of course, should those hands let go, you needn’t worry. The durability of melamine makes these pieces resilient. Including four essential pieces, the Design Letters Alphabet Cutlery set features a fork, knife, spoon and teaspoon. All of which are child-friendly. Each of these pieces features a chic minimalistic design and is emblazoned with letters of the alphabet. This iconic typography was designed by renowned Danish architect, Arne Jacobsen. As well as being stylish and fun, the Design Letters Cutlery set is also education and can be used to help teach your child the alphabet. To complete your set of alphabet tableware, be sure to check out the Design Letter matching bowl, plate and initial cups. 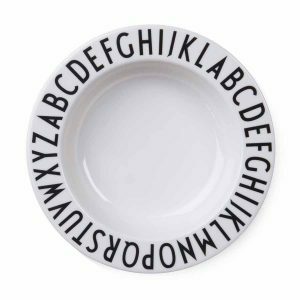 Your little one will be singing their ABCs before you know it with this plate under their nose at breakfast, lunch and dinner. Emblazoned with two sets of the alphabet around its rim, the Design Letters Alphabet Melamine Plate is perfect for teaching children in a fun and engaging way. As well as being educational, this plate is also seriously stylish. Its sleek minimal design, which includes a black and white colour palette, boasts a Scandinavian style that looks great in any home. Even the letters on this piece of children’s tableware are fashionable. The iconic typography was created by renowned Danish designer, Arne Jacobsen. Made from melamine, the Design Letters Plate is also durable and appropriate for little kids. Unlike ceramic dishes, it won’t fall to pieces with the slightest knock or bump. The plate measures 20cm in diameter and is the perfect size for kids’ meals. Messy little eaters will love the deep design of the Design Letters Alphabet Melamine Deep Plate. Featuring typography hand drawn in 1937 by world-renowned Danish architect Arne Jacobsen, this lightweight melamine plate will be a mealtime favourite. 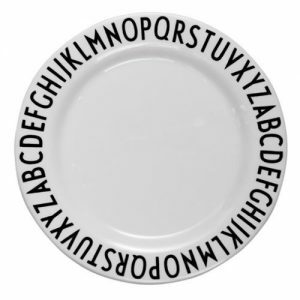 The edge of the plate features the letters of the alphabet, allowing your child to learn their ABCs while tucking into their dinner. Its sleek minimal design, which includes a black and white colour palette, boasts a Scandinavian style that looks great in any home The plate measures 17cm in diameter, making it the perfect size for child-sized meals. Made from melamine, the plate is durable enough for the clumsiest of eaters and won’t break if knocked onto the floor. Also available are the matching cup, bowl, cutlery and plate featuring the same iconic design. 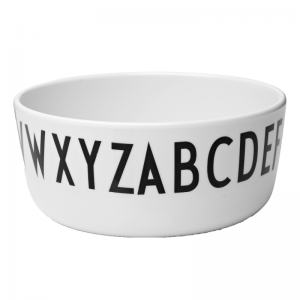 Your little one can now eat their morning cereal and practice their ABCs at the same time with the Alphabet Melamine Bowl from Design Letters. This stylish bowl features iconic typography hand drawn in 1937 by world-renowned Danish architect Arne Jacobsen. This modern design now emblazons the Design Letters range, which also includes plates, cutlery and melamine cup. The melamine bowl measures 11cm wide and is 5cm tall, making it ideal for kid’s meals. 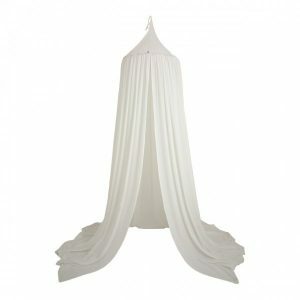 Its sturdy design is durable and practical; unlike ceramic it will survive being knocked and dropped by little hands.